As international educators and recruiters, we often give a great deal of attention to the importance of streamlining application procedures and of providing appropriate supports for students throughout the process of selecting an institution, applying for studies abroad, and all related administrative requirements, particularly those related to student visas. Systems for receiving and managing payments naturally fall within this realm as well. The ease with which students can transfer or verify funds to an institution are important factors in a student’s selection of an institution, but also in reducing processing times and costs for both students and institutions alike. Driven partly by technological change – but also by imperatives to reduce fraud and costs – we now see an expanding field of new payment options and services emerging for both local and international transactions. These range from mobile payment services, such as Google Wallet, to alternate payment methods like Bitcoin, to related processing services, such as the newly expanded FundsV international funds verification service. Each of these services aims to provide greater flexibility and convenience in making payments, but also greater security and integrity in managing payments and financial information. Even so, the prospect of tracking the many developments in this space – or of altering existing payment systems to adopt new payment methods or related services – can be daunting. In some cases, these are relatively new services that are only beginning to take hold in international education. In other cases, such as with some mobile payment technologies oriented to micropayments, they are primarily intended for small, local payments for populations that are underserved by more traditional banking and payment systems and therefore may have little application for international students or institutions. In today’s post, we’ll take a closer look at some of the emerging services in this area. The global tourism industry is often an interesting example for international educators to watch with respect to market trends, including new or emerging technologies. The travel business shares some characteristics of the international education sector: a global clientele, a need to reconcile payments across banking systems and currencies, and, particularly in the case of international travel, the need to securely handle larger transactions. At the same time, there are some important differences as well – the number and variety of transactions and the wider range of channels through which funds are received – that may lead the travel industry to adopt new payment technologies more quickly. The need for greater efficiency in receiving and handling payments was front and centre at the Travolution Summit in London last month. Jason Hancock is the head of channel development with payment solutions provider eNett International. 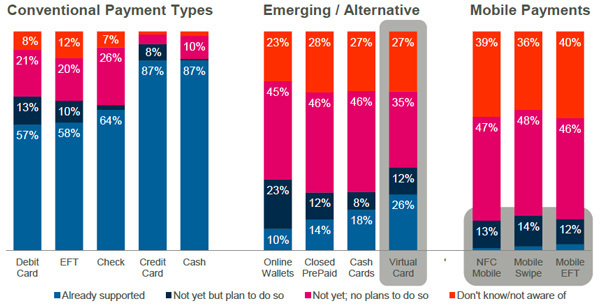 In his conference presentation at Travolution, Hancock drew on recent work by the research firm PhoCusWright to identify a couple of prominent emerging payment technologies in global travel. He notes two alternative payment methods in particular – online wallets and virtual credit cards – as important emerging payment models. Online wallets – including services such as Amazon Payments and Google Wallet – allow registered users to associate a credit card or other payment method with a validated online account, and to then use that account for purchases. One effect of this service is to provide greater security for the user’s credit card (or other underlying payment source) and so to reduce fraud across the system. An online survey conducted early this year found that just over half of all respondents had used a digital wallet service of some kind, with PayPal and Google Wallet being the most prominent choices. Similarly, virtual credit cards are unique credit card numbers that are generated for a single transaction or payee, and typically with a specified limit on transactions and a limited window of time (ranging from a month to a year) for use. The effect again is to provide greater security for both the cardholder and the payee. Virtual credit card services are typically associated with – and the payments guaranteed by – major credit cards or financial institutions. Further along the spectrum of alternative payment methods is the virtual currency Bitcoin. Bitcoin is a peer-to-peer payment network that operates online and revolves around a virtual currency of the same name, the value of which can fluctuate widely. Partly due to this volatility, the e-currency has not found broad commercial application as yet. As of late-2013, it is widely observed that one of the primary uses of Bitcoin is to transfer funds internationally, partly because the fees associated with doing so are considerably less than those charged for more conventional transfers. Perhaps in recognition of Bitcoin’s advantages for international transfers, we are now seeing the first institutions to accept payments via the e-currency. A2Z School of English in the UK bills itself as the first EFL school in the world to accept Bitcoin payments. And the University of Nicosia, the largest private university in Cyprus, has also announced that it will accept Bitcoin payments in a bid to assist foreign students in countries where traditional banking transactions are more onerous or costly. Aside from the question of new payment methods, many institutions are also looking for greater efficiencies in managing admissions procedures across the board, including those processes pertaining to funds verification for applying students. Many institutions and host country governments require prospective students to prove that they have the financial resources needed to carry out their intended programme of study. And international funds verification services, such as the US-based FundsV, aim to make the process of financially qualifying international prospects easier and more secure. After several years of development, including a two-year pilot phase in the US, FundsV is expanding globally this year, in collaboration with the UK-based consultancy Barton Carlyle, to offer an online verification service with links to more than 2,800 banks worldwide. As such, FundsV effectively moves a traditionally paper-based process to a secure, online platform that minimises the opportunity to manipulate financial documents, and with secure access limited to applicants and receiving institutions. Along with providing greater security and integrity in financially qualifying prospective students, services like FundsV aim to achieve some of the same important goals as the alternate payment methods we explored above: to reduce processing and administrative costs and to reduce fraud or misrepresentation across the system. Needless to say, those business goals are constants for institutions and recruiters as well and will no doubt continue to fuel our interest in innovative payment methods and services in the years ahead. This entry was posted in Africa, Asia, Australia/Oceania, Europe, Middle East, North America, Regions, South & Central America, Technology and tagged Trend Alert, mobile marketing, student enrolment, youth travel, postgraduate student recruitment.